BOOK YOUR TICKET DIRECTLY ON THIS SITE, PAY WITH YOUR CREDIT CARD AND RECEIVE 15 - 20% DISCOUNT! BOOK YOUR TICKET DIRECT HERE AND PAY WITH YOUR CREDIT CARD! Apekoptravel.com organizes a daily adventure tour from MOMO BEACH in PANGLAO to QUARTEL BEACH in OSLOB, CEBU. 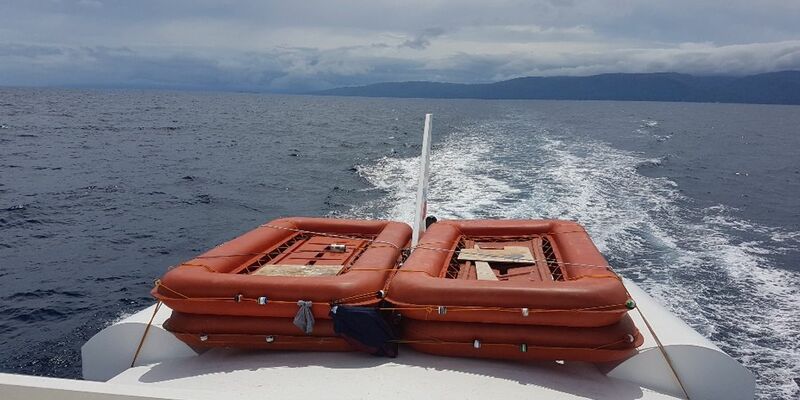 Shipping onto our APEKOP vessel takes place from the shore by small transit boat. Because we do not use official ports, but sail from a beach in Panglao directly to the beach in Oslob we can cut back in travelling time. Our modern hi-speed banca brings you in 90 minutes. We built our beautiful 90 ft ship according the traditional way of building wooden bancas in the Philippines with technical and financial support from the Netherlands. We made alterations, improving comfort and safety up to modern standards. Our ship is therefore officially licenced by the Philippine Marine Authorities. 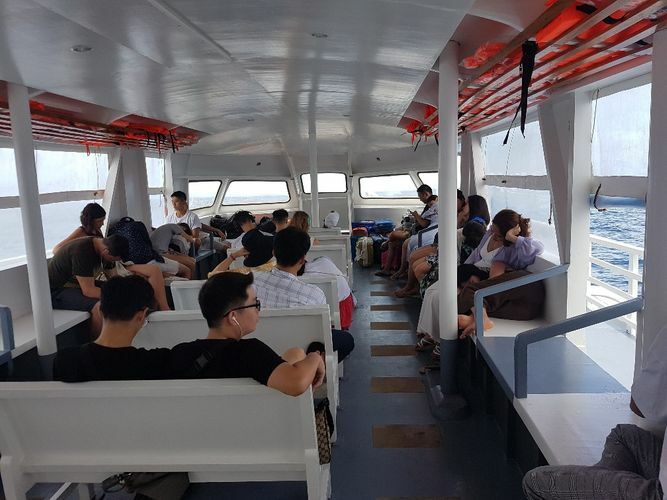 We currently organize daily trips from Panglao Island to Oslob on Cebu Island and back. Free pickup on 05:00 AM from "Rona's Corner" in the centre of Alona, transport to MOMO BEACH, boarding from 05:30 AM, departure 06:30 AM, arrival in Oslob "Quartel Beach" at 08:00 AM. Boarding on Oslob "Quartel Beach", behind the church in Poblacion at 11:00 AM, departure 11:30 AM, arrival in Panglao MOMO BEACH 13:00 PM. Due to our modern high speed engine, the travelling time between the two islands will take no longer than one and a half hour. On board we serve drinks and snacks. 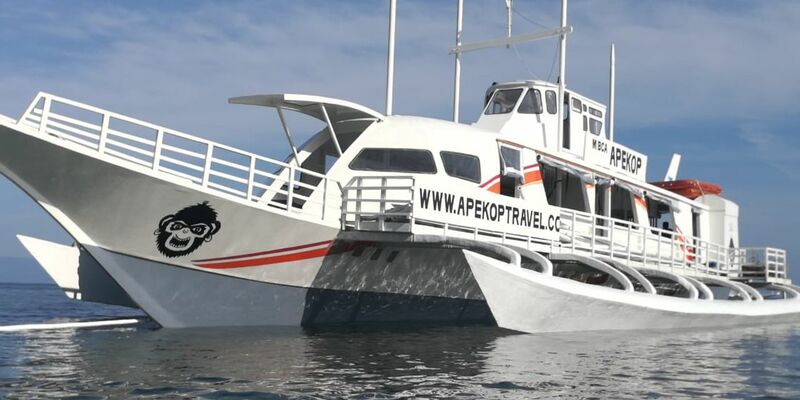 Please consider that the APEKOPTRAVEL.COM is not a ferry line. 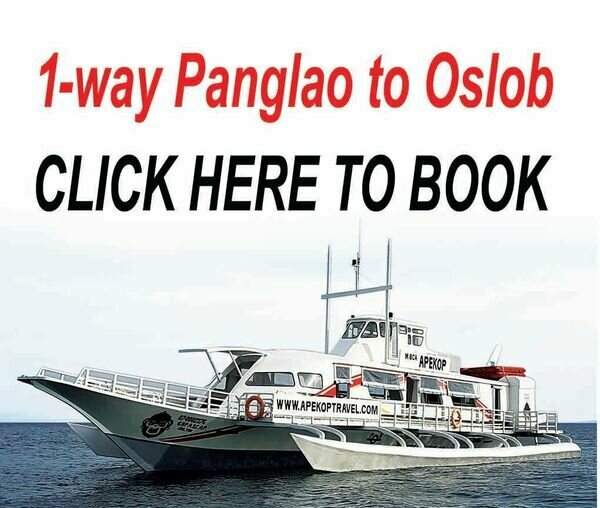 We connect Panglao and Oslob beaches. Embarking and disembarking takes place through small boats to the beaches of both islands.You should not mind getting your feet wet. It is essential for participants of APEKOP-TRAVEL.COM trips to have a good physical and mental condition. The trip could be not suited for parents with young children, elderly, people with disabilities and pregnant women. Consult your travel agent or medical expert if you have any doubts. Apekoptravel.com adventure operates in weather and water conditions that cannot alway be controlled and anticipated. Apekoptravel.com reserves the right to change, interrupt or cancel trips when circumstances make such actions necessary. In those cases Apekoptravel will offcourse refund (part of) the ticket price. For our liabiliy clausules please see our section below. BOOK YOUR TICKET HERE ONLINE, PAY WITH YOUR CREDITCARD! 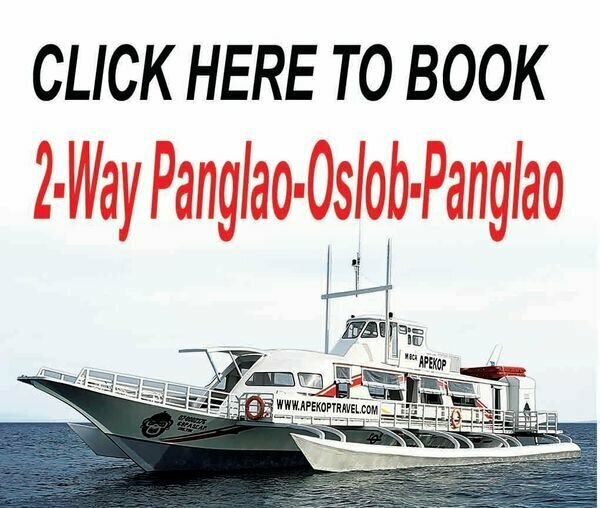 Day return ticket PANGLAO - OSLOB - PANGLAO, boarding from 5:30 AM on MOMOBEACH, departure 6:30AM. - Buy your ticket at a local travel agency. 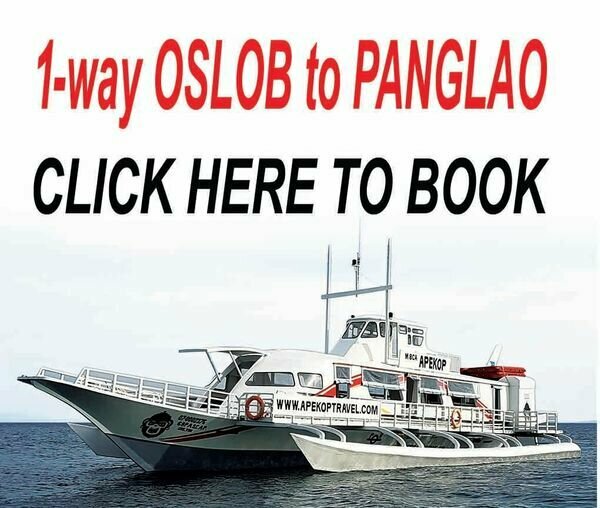 Many ticket offices in Panglao and Oslob and Moalboal sell our tickets. 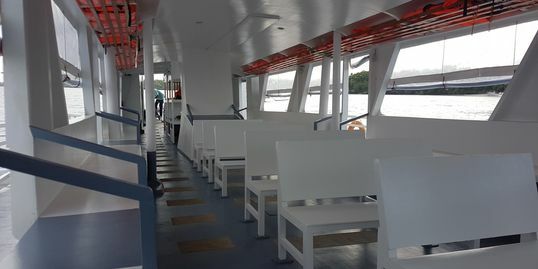 Make sure the ticket you get is for the APEKOP ferry. Prices usually vary between 1000 and 1200 Php per person. -Come to the departure location and buy the ticket as you travel. Price 1200 Php for the day return and 1000 Php for 1-way ticket. Departure from Panglao is 06:30 AM from Momo Beach. Departure from Oslob is 11:30 AM from Quartel Beach. Please come 30 minutes earlier for boarding. Be aware there is a chance to miss out because sometimes the boat is already fully booked. - But we advise you to BUY YOUR TICKET HERE ONLINE at a 15 - 20% DISCOUNT. You can make your booking DIRECT and pay with your credit card or Paypal account. SAFE and EASY. You will receive your ticket by e-mail and you are sure to have your seat. To purchase your ticket press one of the buttons here on our website. WE LOOK FORWARD WELCOMING YOU ON BOARD SOON. - You accept full responsibility and own liability for the Apekoptravel.com activity that you undertake and you declare that you have adequately covered yourself with healthcare- and travel insurance in case of casualty or altering of situations. - You understand and agree that APEKOPTRAVEL.COM's liability ist stricktly limited to the price that was paid for the ticket. - You agree that APEKOPTRAVEL.COM is not responsible for the loss or damage of luggage or other items. You are advised to carry your valuables in waterproof packaging.